Piracy, or thievery on the high seas, is a problem that has popped up on several different occasions in history, including the present. Certain conditions must be met for piracy to thrive, and these conditions were never more evident than during the so-called "Golden Age" of Piracy, which lasted roughly from 1700 to 1725. This era produced many of the most famous pirates of all time, including Blackbeard, "Calico Jack" Rackham, Edward Low and Henry Avery. Conditions have to be just right for piracy to boom. First, there must be many able-bodied young men (preferably sailors) out of work and desperate to make a living. There must be shipping and commerce lanes nearby, full of ships that carry either wealthy passengers or valuable cargo. There must be little or no law or government control. The pirates must have access to weapons and ships. If these conditions are met, as they were in 1700 (and as they are in present-day Somalia), piracy may become common. A privateer is a ship or individual who is licensed by a government to attack enemy towns or shipping during times of war as a private enterprise. Perhaps the most famous privateer was Sir Henry Morgan, who was given a royal license to attack Spanish interests in the 1660s and 1670s. There was a great need for privateers from 1701 to 1713 during the War of Spanish Succession when Holland and Britain were at war with Spain and France. After the war, privateering commissions were no longer given out and hundreds of experienced sea rogues were suddenly put out of work. Many of these men turned to piracy as a way of life. Sailors in the 18th century had a choice: they could join the navy, work on a merchant ship, or become a pirate or privateer. Conditions on board the naval and merchant vessels were abominable. The men were routinely underpaid or even cheated of their wages completely, the officers were strict and harsh, and the ships were often filthy or unsafe. Many served against their will. Navy "press gangs" roamed the streets when sailors were needed, beating able-bodied men into unconsciousness and putting them on board a ship until it sailed. Comparatively, life on board a pirate ship was more democratic and often more profitable. 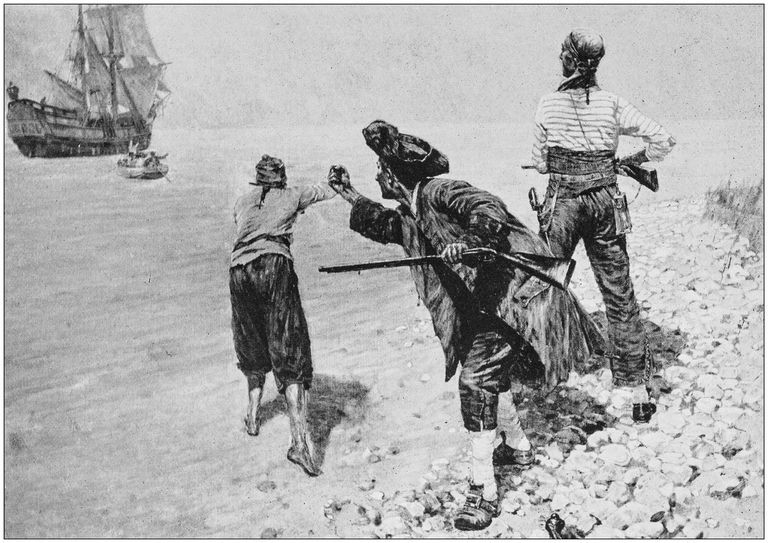 Pirates were extremely diligent about sharing the loot fairly, and although punishments could be severe, they were rarely needless or capricious. For pirates to prosper there must be a safe haven where they can go to restock, sell their loot, repair their ships and recruit more men. In the early 1700s, the British Caribbean was just such a place. Towns like Port Royal and Nassau thrived as pirates brought in stolen goods to sell. There was no royal presence, in the form of governors or Royal Navy ships in the area. The pirates, possessed of weapons and men, essentially ruled the towns. Even on those occasions when the towns were off-limits to them, there are enough secluded bays and harbors in the Caribbean that finding a pirate who did not want to be found was nearly impossible. Around 1717 or so, England decided to put an end to the pirate plague. More Royal Navy ships were sent and pirate hunters commissioned. Woodes Rogers, a tough former privateer, was made governor of Jamaica. The most effective weapon, however, was the pardon. A royal pardon was offered for pirates who wanted out of the life, and many pirates took it. Some, like Benjamin Hornigold, stayed legit, while others who took the pardon, like Blackbeard or Charles Vane, soon returned to piracy. Although piracy would continue, it was not nearly as bad a problem by 1725 or so. Pirates, Privateers, Buccaneers, and Corsairs: What's the Difference?